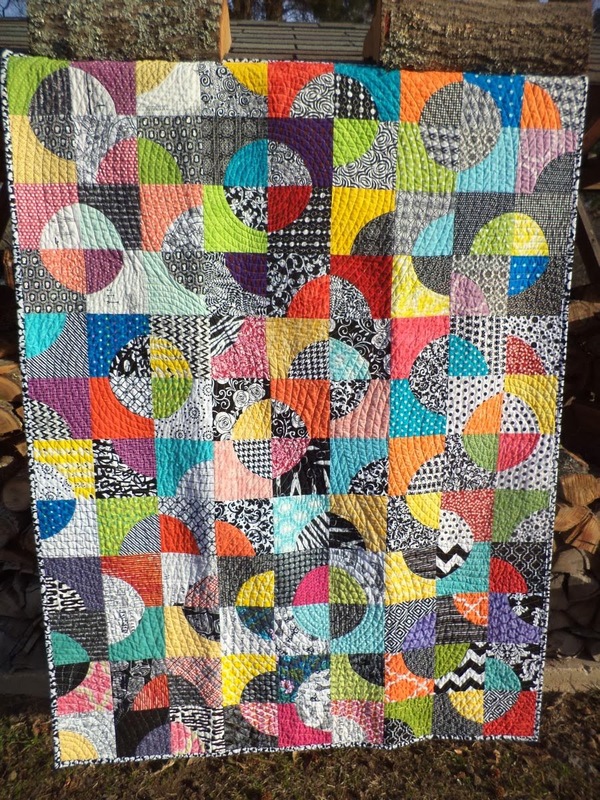 Kat & Cat Quilts: Around the World Bloghop - My turn! Hey everyone, I am sure you have seen the Around The World Bloghop going on around blogland. I was tagged last week by the wonderful Liz of LizzyClips Design. So now I get to answer these 4 simple questions! I am sort of in a lull today. Over the weekend I finished Ben's quilt, which was the big one I had been working on. And I quilted the panda quilt, too ("finish" posts are not up yet for either one.) 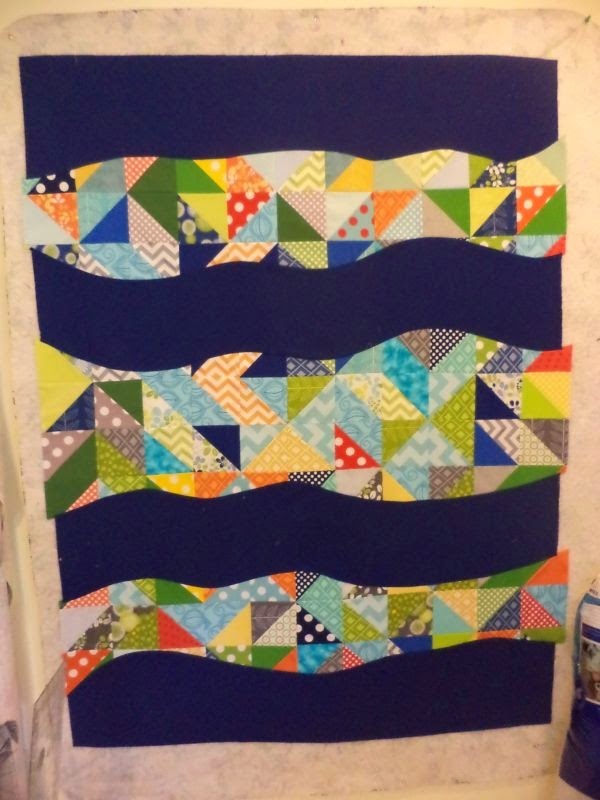 The HST waves quilt (above) is a finished top that needs to be basted and quilted before the baby it's meant for arrives. Obviously I'm a modern quilter, but I like to think that I am informed by traditional designs and techniques. Sometimes that means I modify a traditional design into a modern quilt, like in the Drunken Circles quilt or the off center Lonestar. Other times I actually make designs that are pretty traditional, with just a little modern twist, like the Crumb Jar Nines. I also have a strong preference for using scraps, which I think is somewhat uncommon in the "modern" quilt world. 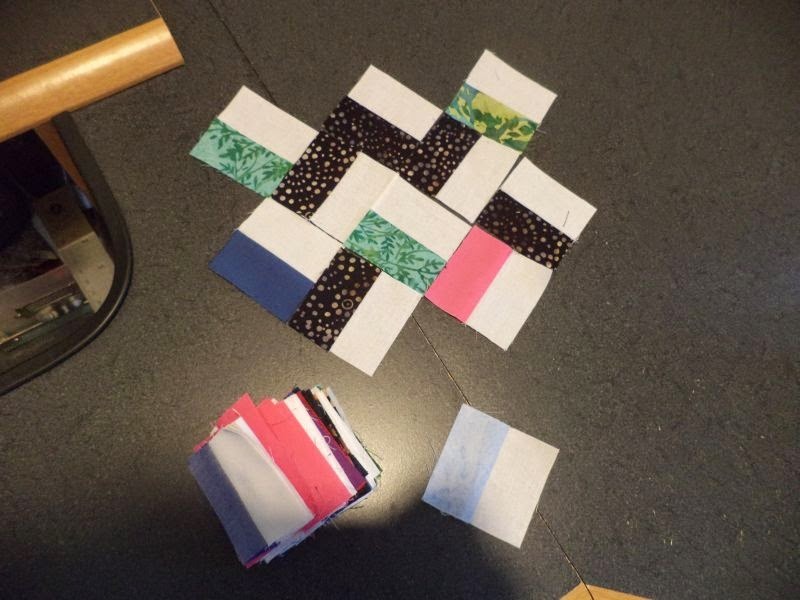 I find scraps more inspiring than whole cuts of fabric; I'd rather make a quilt from scraps any day. I save everything down to about 1" square, and I have found ways to use them, too! My Sherwood Forest quilt used any crumbs that were at least 1.5" on one side. 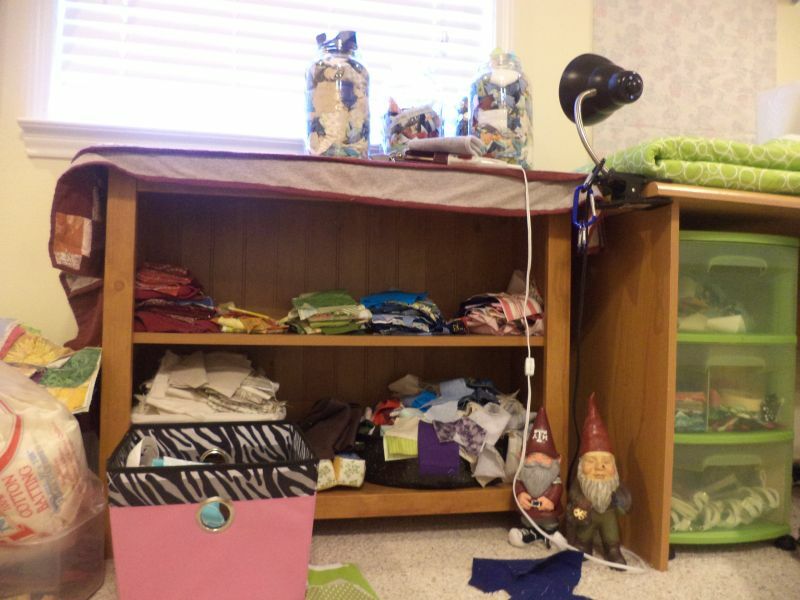 Why do I quilt and blog? Over the years I have found a lot of different ways to spend my time and satisfy my creative drive. I write, do community theater, play computer games (yes, that can be creative!) But I have to say quilting is the best thing I have come across. It appeals to me because I can see a project though from idea to completion, which I could also get somewhere else, but quilting is unique because at the end of the day I have a tangible object to show for my work. Quilts are perfect for gifting to other people because every one can use a blanket. It's not just pretty to look at, it 's useful. Not like something you're going to put up on a shelf and have to dust around constantly. Usually people are really really excited about getting a homemade quilt; most people have never had one. I gave a friend his a couple days ago and this 32 year old man did the cutest little happy dance you've ever seen. I blog simply because I want to remember the quilts I have made. Every quilt has a story and I want to keep those stories written down. I average upwards of 20 quilts a year, so if I didn't have a record of them I would never remember! You can see my old quilts in the "Finished Quilts" tab above. Often my design process starts with a picture I've seen. I have a large file of "inspiration" photos on my computer. Then I usually move to graph paper, do some quick math, and get into the actual cutting an assembling. I don't like to spend too much time planning things out before I start and frequently make changes as I go. I also sometimes start my design process with a particular fabric(s) I want to use. Whenever one of my sections of scraps is overflowing it's time to make a quilt using triangles or strings or blue tones, whatever it may be. That is my favorite place to start from. I like trying to solve the problem of turning scrap fabrics into something useful and beautiful. So there you go, Kat the Quilting in a nutshell! For the bloghop to continue I'm supposed to tag a few people to post next. I am tagging the very creative Mihaela at "A Beautiful Day". 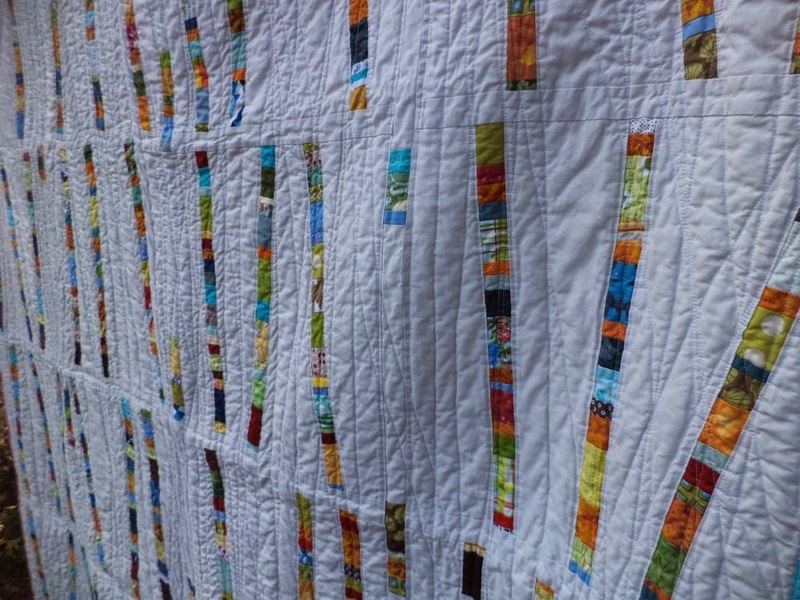 She makes the most wonderful quilt patterns based on traditional Romanian needle point. I used one of her patterns to make my Country Home quilt. I am also tagging Barb from Cat Patches, who blogs about quilting, cats, travel, gardening, and canning - all of my favorite topics! 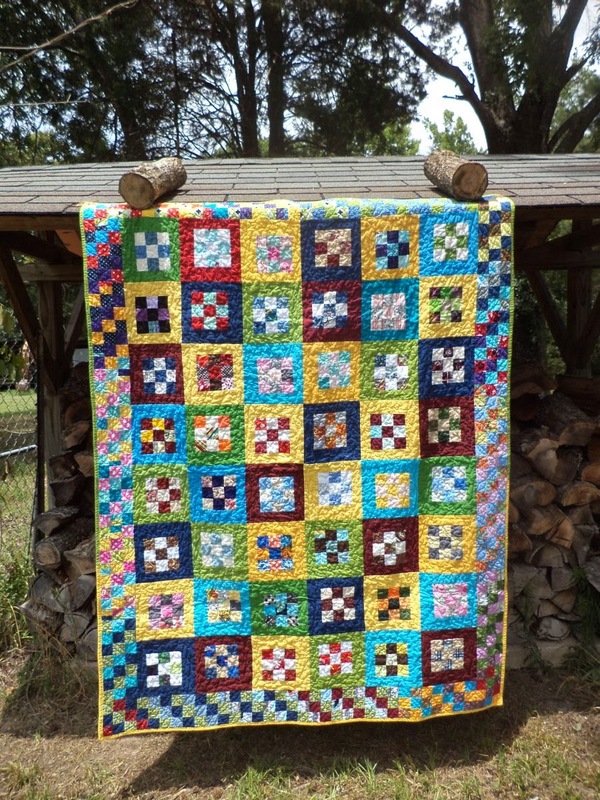 I love your scrappy projects - and am newly in love with the Sherwood Forest quilt. Awesome! I enjoy reading the around the world blog hop posts. It's nice to see that you can confidently answer how your style differs from others, because nearly everyone who has participated in this blog hop appears to struggle with that one.